WHILE Vincent de Paul was striving, by charity and patience, to renew all things in Christ, the Jansenists* were busy spreading their dangerous doctrines. When the Abbé de St. Cyran, the apostle of Jansenism in France, first came to Paris, Vincent, like many other holy men, was taken in by the apparent piety and austerity of his life. It was only when he knew him better, and when St. Cyran had begun to impart to him some of his ideas on grace and the authority of the Church, that Vincent realized on what dangerous ground he was standing. * So called from their founder, Cornelius Jansen, Bishop of Utrecht, who died, however, before his heresy had been condemned. "He said to me one day," wrote the Saint long afterwards to one of his Mission Priests, "that it was God's intention to destroy the Church as it is now, and that all who labor to uphold it are working against His will; and when I told him that these were the statements made by heretics such as Calvin, he replied that Calvin had not been altogether in the wrong, but that he had not known how to make a good defense." 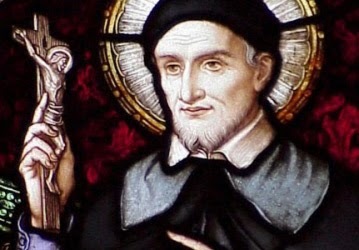 After such a statement as that there could be no longer question of friendship between Vincent and St. Cyran, although the latter, anxious not to break with a man who was held in such universal esteem as Vincent de Paul, tried to persuade him that he, St. Cyran, was really in the right, justifying himself in the elusive language which was more characteristic of the Jansenists than the frank declaration he had just made. Vincent, however, was too honest and straightforward, too loyal a son of the Church, to be deceived. Realizing fully the danger of such opinions, he soon became one of the most vigorous opponents of the Jansenists, who, indeed, soon had cause to look upon Vincent as one of the most powerful of their enemies. But although he hated the heresy with all the strength of his upright soul, Vincent's charitable heart went out in pity to those who were infected with its taint, and it was with compassion rather than indignation that he would speak of St. Cyran and his adherents. Not until they had been definitely condemned by the Church did he cease his efforts to win them from their errors—efforts which were received, for the most part, in a spirit of vindictive bitterness. "Your last letter says that we have done wrong in going against public opinion concerning the book Frequent Communion and the teaching of Jansenius. It is true that there are only too many who misuse this Divine Sacrament. I myself am the most guilty, and I beg you to pray that God may pardon me . . . . You say also that as Jansenius read all the works of St. Augustine ten times, and his treatises on grace thirty times, the Mission Priests cannot safely question his opinions. To which I reply that those who wish to establish new doctrines are always learned and always study deeply the authors of which they make use. But that does not prevent them from falling into error, and we shall have no excuse for sharing in their opinions in defiance of the censure of their doctrine." "It may be, as you say," he writes, "that certain people in France and Italy have drawn benefit from the book; but for a hundred to whom it has been useful in teaching more reverence in approaching the Sacrament, ten thousand have been driven away . . . For my part, I tell you that if I paid the same attention to M. Arnauld's book as you do, I should give up both Mass and Communion from a sense of humility, and I should be in terror of the Sacrament, regarding it, in the spirit of the book, as a snare of Satan and as poison to the souls of those who receive it under the usual conditions approved by the Church. Moreover, if we confine ourselves only to what he says of the perfect disposition without which one should not go to Communion, is there anyone on earth who has such a high idea of his own virtue as to think himself worthy? Such an opinion seems to be held by M. Arnauld alone, who, having made the necessary conditions so difficult that St. Paul himself might have feared to approach, does not hesitate to tell us repeatedly that he says Mass daily." It is evident that so cold and narrow a teaching could not but be repugnant to a man of Vincent's breadth and charity. The monstrous heresy held by the Jansenists that Christ did not die for all men, but for the favored few alone, filled him with a burning indignation. No one could have deplored more than he did the unworthy use of the Sacraments; but he held firmly to the truth that they had been instituted by a loving Saviour as man's greatest strength and as a protection against temptation and sin. And he was not going to believe that He who had been called the Friend of sinners and had eaten and drunk in their company would exact from men as a condition of approaching Him a perfection that they could never hope to attain without Him. Indeed, the chief aim of the company of Mission Priests was to draw the people to the Sacraments as to the great source of grace, and it seemed to Vincent that the means taken by the Jansenists to destroy certain evils were very much more dangerous than the evils themselves. It was better, according to his opinion, even at the risk of abuse, to make the reconciliation of a sinner to his God too easy rather than too hard. The rule of the Mission Priests lays down that "one of the principal points of our Mission is to inspire others to receive the Sacraments of Penance and of the Eucharist frequently and worthily." The teaching of the Jansenists sought, on the contrary, to inspire such awe of the Sacraments that neither priests nor people would dare to approach them save at very rare intervals. It was the great mass of the people—poor, simple and suffering, those children of God whom Vincent loved and in whose service the whole of his life had been spent—whose salvation was in danger. It was against them that the Jansenists were shutting the doors of salvation. Is it any wonder that Vincent de Paul fought against them as only men of strong conviction can fight, with heart and soul aglow in the battle? Compared with this all other evils were light. His business was to relieve suffering, to comfort sorrow, but above all to help men to save their souls. There could be no yielding, no compromise with error. Rightly, therefore, did the Jansenists see in Vincent de Paul the most dangerous of their enemies, and it was not surprising that both during his life and after his death they hated him and assailed him with abuse. He was "insincere, treacherous, a coward," they declared. They spoke of the "great betrayal"; they held him up to ridicule as an ignorant peasant; but Vincent went quietly on his way. The question "What will people say?" did not exist for him. He simply did his duty as it was made clear to him by God and his own conscience. It was hard to fight against such uncompromising honesty as his, and more than once the man whose ignorance the Jansenists had ridiculed tore their specious arguments to tatters with the weapon of his strong common sense. Nevertheless, the dangers of Jansenism were a continual anxiety to Vincent, and there were other sorrows no less poignant to be borne. Foreign missions had been established in Africa and Madagascar, and in the latter station no less than twenty-seven Mission Priests had lost their lives. Some, it is true, had died the martyr's death; but the work had not prospered. It was difficult to get news from far countries in those days, and there were often such long intervals between the death of one priest and the arrival of another that any good that had been done was lost. "There is nothing on earth that I desire so much as to go as your companion in the place of M. Gondrée," wrote Vincent to one who was just about to set forth on this dangerous mission; but the darker side of the picture is not left untouched. "You will need the strongest courage," he writes; "you will need faith as great as that of Abraham." The Madagascar Mission was, humanly speaking, a failure; the natives were hostile, the missionaries not sufficiently numerous; it was necessary in the end to give up the enterprise. He could afford to leave his work and theirs in the hands of God. He had done what he could, and God asks no more of any man. The Parliament at last took up the matter; men went about the streets of Paris shouting "Down with Mazarin!" A revolution was feared, and the Queen, with her young son, fled to St. Germain. The Royal troops in the meantime, under Condé, were blockading Paris; the rebellion known as the "Fronde" had begun. Vincent de Paul was in a difficult position. His sympathies were wholly with the suffering people; but, although it had long ceased to meet, he was still a member of the Council of Conscience and owed allegiance to the Royal party. What would become of the poor in Paris if the town were reduced to famine? This was the thought that was uppermost in his mind. On the other hand, he had always insisted that the Congregation of the Mission should in no way mix itself up with politics. The life of its members was to be a hidden life of prayer and labor for souls. The safest course was obviously to remain neutral and take no part in the matter; but his own safety was the last consideration likely to move him. Was it his duty to remain silent? That was the vital question. Could he do any good by speaking? Long and earnestly did he pray for guidance and, without a thought of the consequences to himself, decided at last to act. Judging of others in the light of his own straightforward honesty, it seemed to him that if it were once clearly represented to the Queen that it was Mazarin's presence alone that prevented peace, she could not fail to see that it was her duty to force him to withdraw. Surrounded as she was by courtiers who did not dare to tell her the truth, she might be ignorant of how much she herself was to blame in the matter. He had shamed her into doing what was right in the matter of the Bishop of Poitiers. Might he not succeed in awakening her conscience once more? It was on his knees in the Church of St. Lazare that Vincent resolved on the action that was at best only a forlorn hope, but still worth trying. With his usual prompt energy, the old man of seventy-three mounted his horse and, accompanied only by his secretary, du Courneau, set out for St. Germain. The Seine was in flood and the water breast-deep on the bridge over which they had to ride. Du Corneau [sic] avowed afterwards that he was quaking with fright; but Vincent, though wet to the skin, scarcely seemed to notice that all was not as usual and rode on through the floods in silence. Arrived at St. Germain, he asked to see the Queen, who, thinking that he had been sent by the people to make their peace with her, admitted him at once to her presence. With the straightforward simplicity that characterized all his dealings, he proceeded to state his errand. He had come, he said, to ask the Queen, for the sake of her country and her people, to rid herself of Mazarin and to forgive the rebels. Anne of Austria listened in silence and gave no sign of either sympathy or displeasure. When the speaker had ended, she quietly referred him to Mazarin himself. Vincent's hopes must have sunk low indeed at such a suggestion, but he was determined to go through with what he had begun. Confronted with the Cardinal, he earnestly represented to him that it was his duty to sacrifice himself for the good of the country; that his retirement would be an act of noble unselfishness which could not fail to win the blessing of Christ; that it would put an end to the sufferings under which France was groaning and save many innocent people from a fearful and horrible death. Mazarin had a sense of humor, and it was perhaps the only thing about him that responded to this appeal to his better feelings. It no doubt appeared to him sufficiently ludicrous that anyone should expect him to sacrifice himself for the sake of others, and probably those around him would have shared his opinion. Yet Vincent was justified in his experiment. Long as had been his experience of the sin and misery of men, it had not taught him, any more than it did his Divine Master, to despair of human nature. He had only employed his usual methods with Mazarin: methods that had prevailed with so many souls. He had appealed to the desire for good which he believed lay hidden in the heart of every man, no matter how deeply it might be buried under the refuse of a wasted life. He had appealed and failed—his mission had borne no fruit, yet he could not regret that he had undertaken it, although the consequences were to be serious for himself. For during his absence the fact that he had gone to St. Germain had leaked out among the people, and in one moment of anger all his claims on their love and gratitude were forgotten. "M. Vincent has betrayed us to the Queen!" was the cry in the streets of Paris, while the mob, falling on St. Lazare, pillaged it from top to bottom, carrying off everything on which they could lay hands. Vincent had gained nothing and lost all; it was not even safe for him to return to Paris, so great was the fury of the people; he had also won for himself the ill will of both Mazarin and the Queen. Yet with his usual humility and patience, he blamed no one but himself. He had done, he declared solemnly to du Courneau, that which he would have wished to have done were he lying on his deathbed; that he had failed was due solely and entirely to his own unworthiness. And now, since it was better for every reason that he should not return to Paris, he determined to undertake a visitation of the Congregation of the Mission Priests and Sisters of Charity in every center where they were working in France. In spite of his weariness and his seventy-three years, he set forth on his journey, riding the old horse that was kept to carry him now that he could no longer travel on foot. The suffering and misery that he witnessed, the horrors of famine and of war, only seemed to redouble his zeal to win the souls of men for their Maker. He knew the purifying force of suffering borne for God; he knew also the danger of despair. These poor creatures must be taught at any cost to lift their hearts to God, to bear their anguish patiently, to remember amid what agonies the Son of God had given His life for them. Wherever he went, his burning words and heroic example infused new life and courage into the hearts of his sons and daughters in Christ, who, in the life of abnegation they had undertaken, had often good reason for despondency. Traveling in these lawless times was both difficult and dangerous, for the country roads were infested with robbers, but Vincent had no fear. He was seldom free from illness, which was sometimes increased by the privations he had to undergo, but he traveled on without resting. Yet, amid all the new suffering which he had to witness and relieve, he was always mindful of his dear poor in Paris, which was still besieged by the troops of Condé. He had obtained a promise from the Queen during their last interview to let grain be taken into the town to feed the starving inhabitants, but she had not had sufficient energy to see that it was carried out. The people were beginning to realize what they had lost in M. Vincent and to suspect that they had misjudged him. Hunger at last forced them to make terms with the Royal party, although the hated Mazarin was still supreme, and the Queen and her young son re-entered Paris in triumph. But even Anne of Austria was not so foolish as to make her entry with the Cardinal at her side, and during the few weeks which still elapsed before he made his appearance in the capital, the Queen, free for a moment from the evil influence that stifled all her better impulses, wrote to Vincent, begging him to return. He was ill at Richelieu when the message reached him, and the Duchess d'Aiguillon, one of the most devoted of his Ladies of Charity, sent a little carriage to fetch him. She had known him long enough, however, to be sure that his love of mortification would prevent him from availing himself of what he would certainly look upon as a luxury. The carriage was accompanied by a letter from the Queen and the Archbishop of Paris ordering him in virtue of obedience to use it in the future for all his journeys. He obeyed, but sorely against the grain, and as long as he was obliged to avail himself of it always referred to the little carriage as his "disgrace." "Come and see the son of a poor villager riding in a carriage," he would say to his friends when he took leave of them; and indeed, "M. Vincent's little carriage" soon became well known in Paris. It was always at the disposal of anyone who wanted it, and when Vincent used it himself it was generally shared by some of his beloved poor. The fact that it came in handy for taking cripples for a drive or the sick to the hospital was the only thing that reconciled him to its possession. Vincent once more in their midst. WHEN at last peace was partially restored to the country, the number of poor people had enormously increased, and the charities that already existed were unable to cope with the misery and poverty in Paris. It was at this time that Vincent conceived the idea of founding a house of refuge for old men and women who had no means of gaining a livelihood. The foundation was placed in the charge of the Sisters of Charity. Work was provided for those who were able to do it; the proceeds went to keep up the establishment. So successful was the venture and so happy were the poor creatures who found a comfortable home and kind treatment in their old age that the Ladies of Charity determined to found an institution on the same lines for all the beggars of Paris. A large piece of ground that had been used for the manufacture of saltpetre was accordingly obtained from the King, who also gave a large contribution of money toward the undertaking. The hospital, known as "La Salpêtrière" from the use to which the ground had formerly been put, was soon in course of building, but the beggars who were destined to 1711 it, many of whom were worthless vagabonds, showed very little desire for being shut up and employed in regular work. Vincent would have preferred to begin in a small way with those who were willing to come in; but the Ladies of Charity, in their enthusiasm, declared that it would be for the beggars' own good to bring them in by force, and the King was of their opinion. The Salpêtrière was soon crowded, while the sturdy rascals who infested the streets and begged under pretense of infirmity were suddenly cured at the prospect of leading a regular life and working for their living. Begging, at the risk of being taken off to the Salpêtrière, soon became an unpopular occupation, and the streets of Paris were a good deal safer in consequence. In 1658, two years before his death, Vincent de Paul gave to the Congregation of Mission Priests its Rule and Constitutions. It was the work of God, he explained to them; there was nothing of his own in it. If there had been, he confessed humbly, it would only make him fearful lest his touch might spoil the rest. Those who listened to him and who had been witnesses of his long and holy life, his wisdom and his charity, knew better. St. Lazare was a center where all fervent souls zealous for the service of God and the good of others met to find counsel and inspiration at the feet of its holy founder. Letters from all parts of the world and from all kinds of people in need of help and counsel kept the old man continually busy during the time he was not giving instructions, visiting the sick, or receiving those who came to ask his advice. He rose at four o'clock to the very end of his life and spent the first hours of the day in prayer, and this in spite of the fact that the last years of his life were years of acute bodily suffering. His legs and feet, which for a long time had caused him great pain, became so swollen and inflamed that every step was torture. Ulcers, which opened and left gaping wounds, next made their appearance. It was said that in earlier years he had taken the place of an unfortunate man who had been condemned to the galleys and who was in consequence on the verge of despair, and that the malady from which he suffered had been caused by the heavy fetters with which his legs had been chained to the rowers' bench. It was several months, ran the tale, before his heroic action had been discovered and he was set at liberty, to bear for the rest of his life the penalty of his noble deed. When asked if this story were true, Vincent would change the subject as quickly as possible—which to those who knew how eagerly he always disclaimed, if he could, any action likely to bring honor to himself, seemed a convincing proof of its truth. With the greatest difficulty he was induced during the last years of his life to have a fire in his room and to use an extra coverlet, though he reproached himself bitterly in his last conferences to the Mission Priests and the Sisters of Charity "for this immortification." But there were sufferings harder than those of the body. Mazarin was still in power; the "accursed barter of bishoprics" was still going on; and Vincent was forced to witness the very abuses against which he had fought so bravely during the brief time of his influence at Court. The year 1660 brought two great sorrows: the death of M. Portail, the oldest and best beloved of Vincent's companions at St. Lazare, and that of Louise le Gras, the devoted Superior of the Sisters of Charity and the woman who would become known as St. Louise de Marillac. "You are going a little before me," he wrote to the latter when he heard that her life was despaired of, "but I shall meet you soon in Heaven." He was unable to go to her, for he could scarcely walk and was racked with fever. He would struggle on his crutches as far as the chapel to hear the Mass that he could no longer say and then go back again to his room, where he sat at a little table, working to the last, with a gentle smile of welcome for all who sought him. The letters written during the last days of Vincent's life are full of the same good sense, the same lucid clearness of thought, the same sympathy and knowledge of the human heart that always characterized him. Two months before his death he gathered the Sisters of Charity together and gave them a conference on the saintly death of their Superior. With touching humility he asked his dear daughters to pardon him for all the faults by which he might have offended them, for any annoyance that his "want of polish" might have caused them, and he thanked them for their faithful cooperation in all his schemes of charity. It was now such agony for him to walk to the chapel that his sons begged him to allow them to fit up a little oratory next to his room where Mass might be said, but Vincent would not hear of it. Then they implored him to allow himself to be carried in a chair, but, unwilling to give others the trouble of carrying him, he evaded the question until six weeks before his death, when he could no longer support himself on his crutches. During the nights of anguish, when his tortured limbs could find no rest on the hard straw mattress which he could never be prevailed upon to change for something softer, no complaint ever passed his lips. "My Saviour, my dear Saviour" was his only exclamation. On the days that followed these sleepless nights of pain, he was always smiling and serene. In spite of the weakness that oppressed him, he had help, advice and sympathy for everybody. His reward was close at hand. On the 26th of September, 1660, having been carried to the chapel for Mass and Holy Communion, he was taken back to his room, where he fell asleep in his chair from sheer exhaustion, as he had so often done before. The brother who had charge of him, thinking that he slept longer and more heavily than usual, awakened him and spoke to him. Vincent smiled and answered, but instantly fell asleep again. The doctor was sent for, and roused him again. Once more the same bright smile lit up the old face; he answered, but had not sufficient strength to speak more than a few words. In the evening they gave him the Last Sacraments, and he passed the night in silent prayer. In the early morning one of the priests who belonged to the "Conferences," and who was making a retreat in the house, asked the dying man to bless all the priests for whom he had done so much and to pray that his spirit might be with them. "May God, who began the good work, bring it to perfection," was the humble answer. A little later he was heard to murmur softly, "Confido"—"I trust"; and with these words on his lips, as a child puts its hand into that of his Father, he gently gave up his soul to God.